Symmetry in the Ganges. 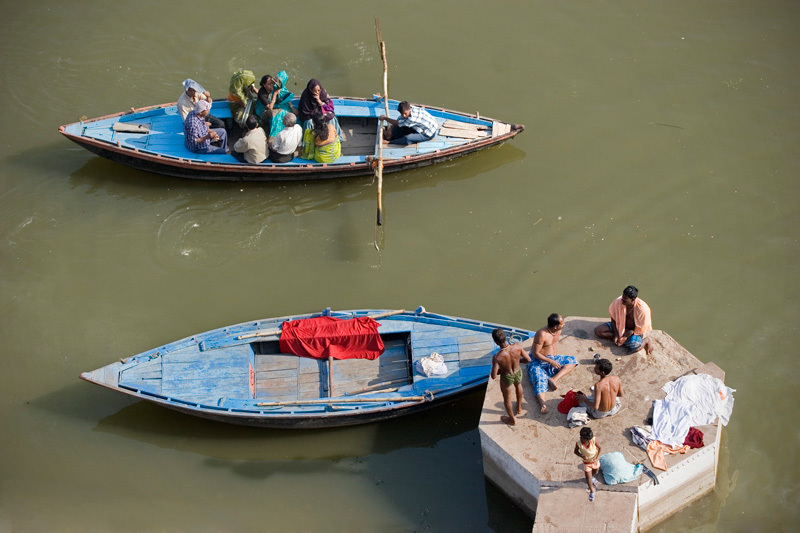 The boat ride is a very common activity for hindu pilgrims and tourists in Varanasi. Puja in Haridwar. This worship consists of a ritual of offerings and prayers. 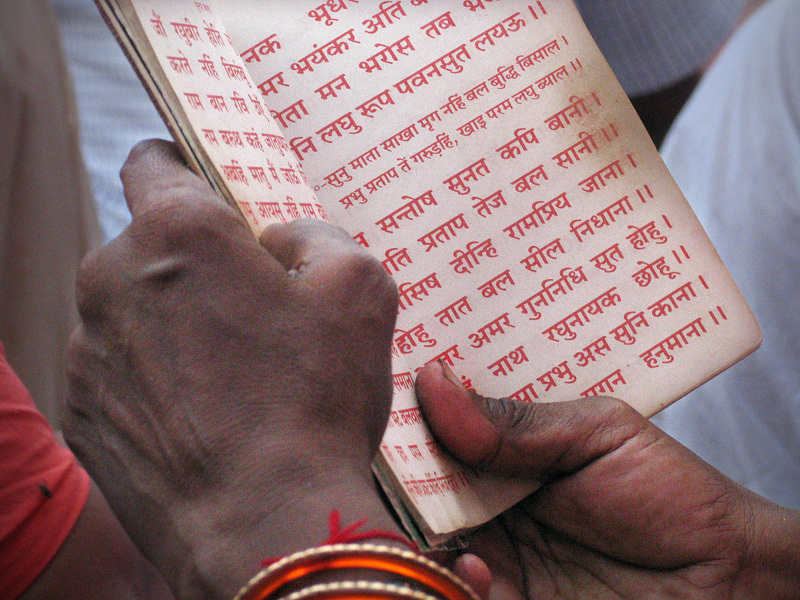 For the majority of Hindus, the most important religious path is devotion (bhakti) to gods. 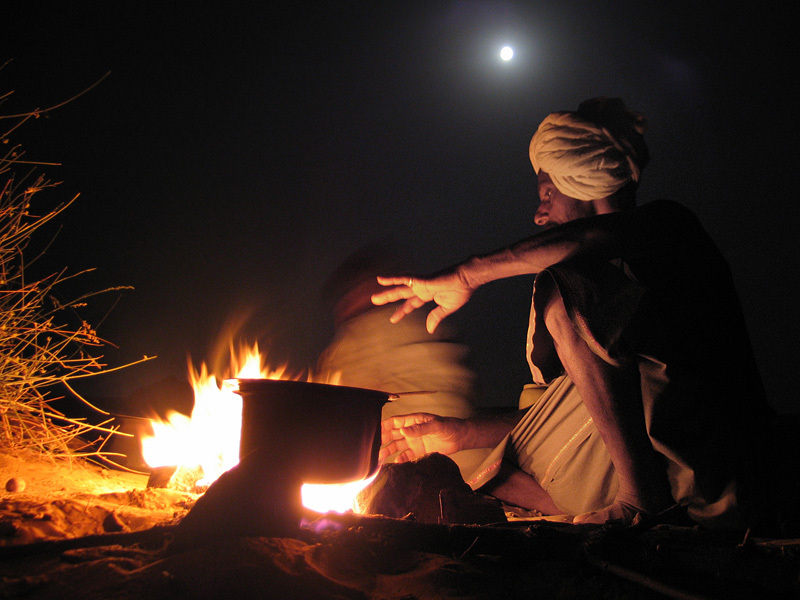 Saffron, sacred ash or turmeric powder is often used for purification. 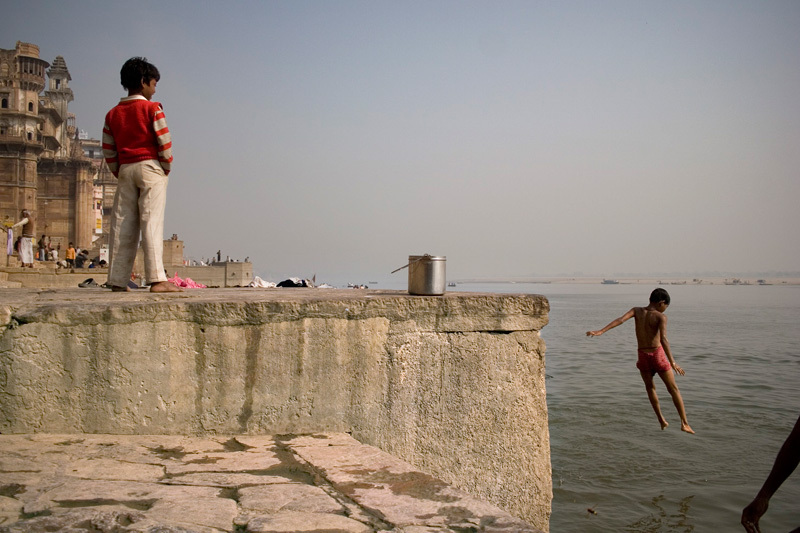 A boy jumps into the river Ganges in Varanasi. The values ​​of most of the polution parameters in the river are, still today, alarmingly high. 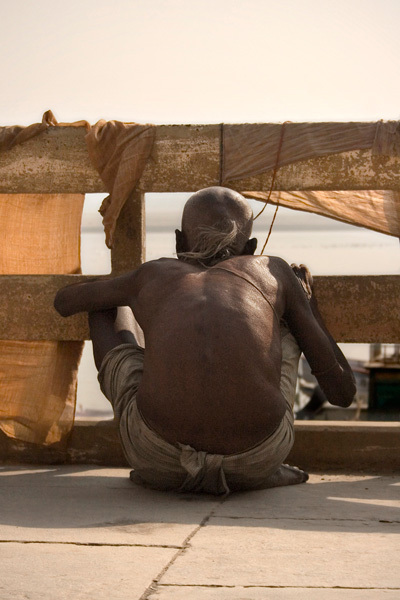 Hindus believe that dying in Varanasi ensures release of a person's soul from the cycle of its transmigrations. Thus, many Hindus arrive here for dying. 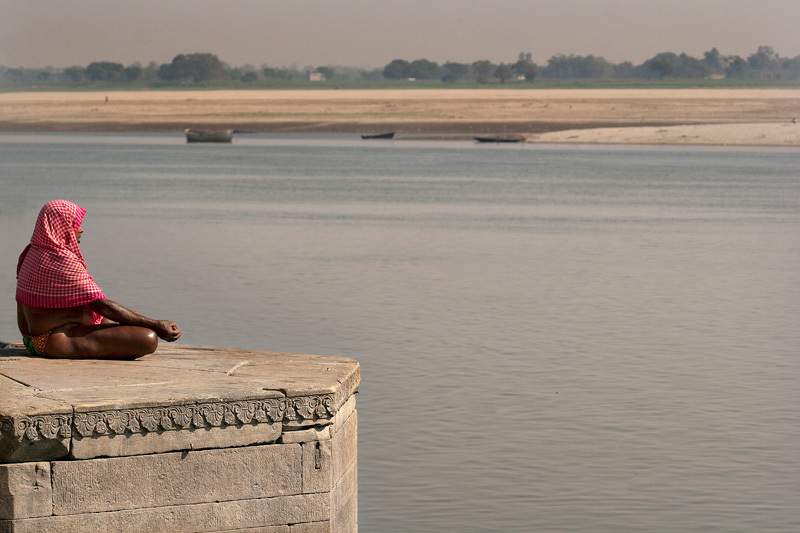 A man meditating in Varanasi's banks. This city is considered the spiritual capital of India. 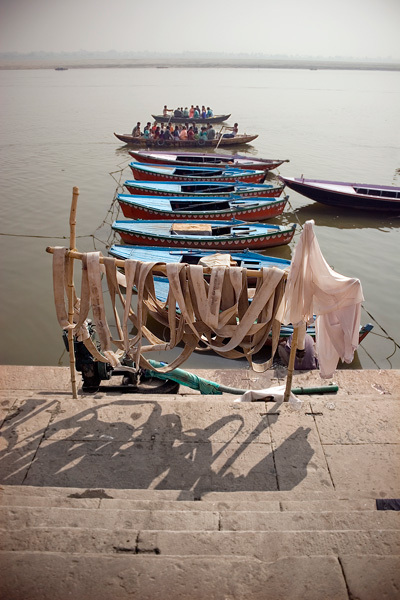 Two boats full of passengers, traveling in opposite directions, coincide in time and space in front of one of the piers in Varanasi. 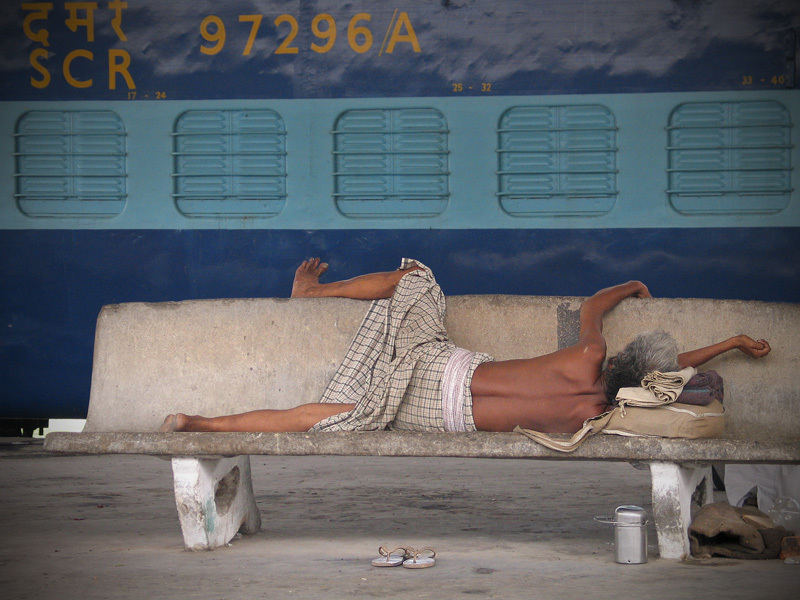 A pilgrim sleeps sprawled on a bench in the train station of Rishikesh, beside his tiffin box and chappals. Reading a writing from the 5th book of Ramayana called the "Sundarkand", from the 16th century, on the banks of the Ganges, as it passes through Rishikesh. 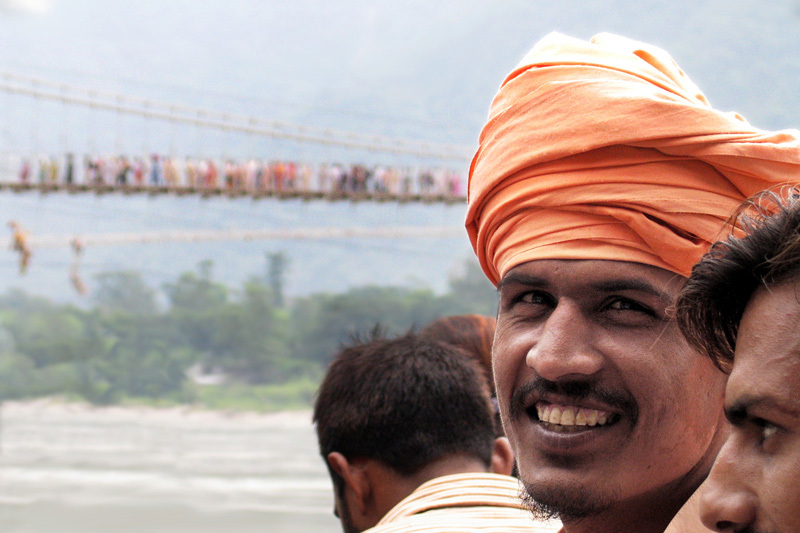 Located in the foothills of the Himalayas, Rishikesh it's known as The Gateway to the Himalayas. Rishikesh, sometimes nicknamed "the world capital of Yoga", has numerous yoga centres that attract many Saddhus (ascetic, wandering monks) and tourists. 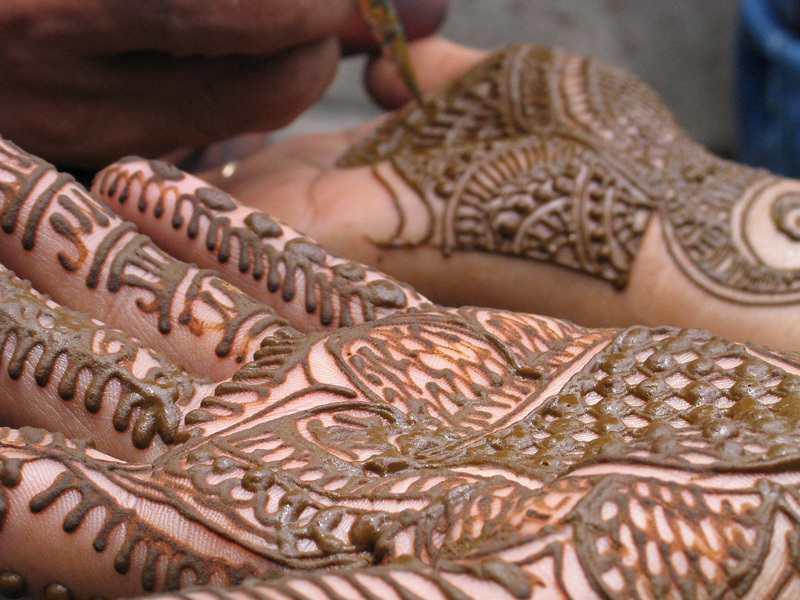 Mehndi, the ceremonial art form made out of henna, is typically applied to brides before wedding ceremonies. 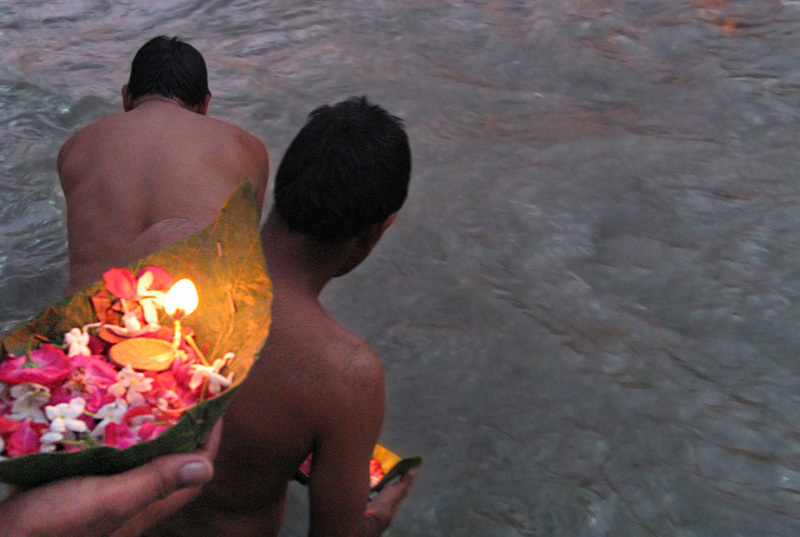 The Ganges, the sacred river, receives offerings of flowers in Haridwar. Devotees believe that bathing in the river causes the remission of sins and facilitates liberation from the cycle of life and death. The Bhagirathi river as it passes trough Gangotri. This is the source stream of the Ganges, the holy river of Hinduism. 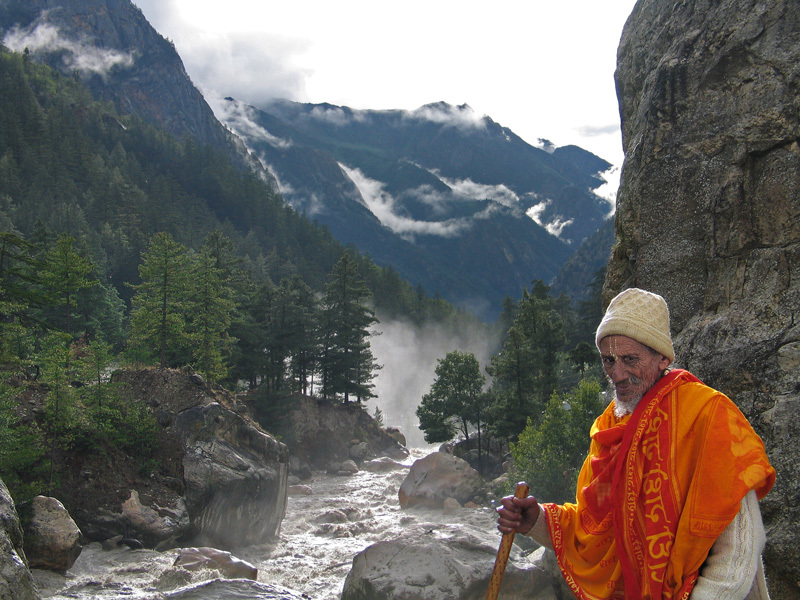 Gangotri is one of the four sites in the Char Dham pilgrimage circuit. 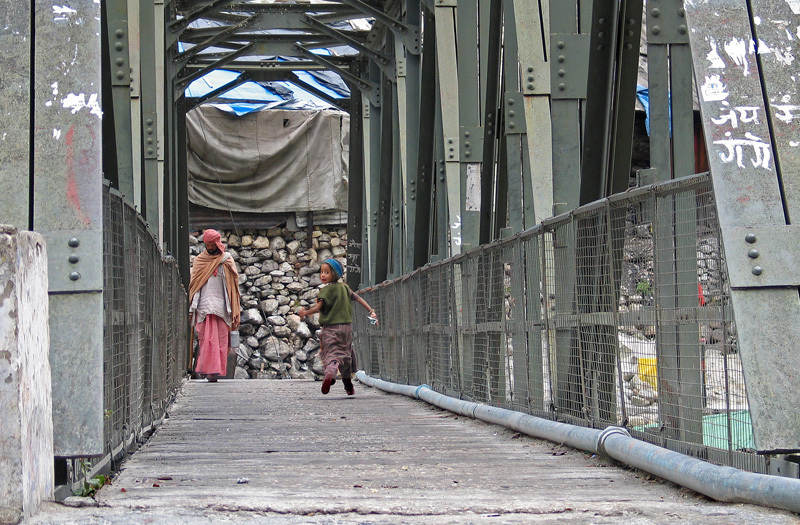 A boy and a pilgrim crossing a bridge over the river Bhagirathi in Gangotri. A mother assures her son as the bus descends the road to Gangotri, the spiritual source of Ganga. 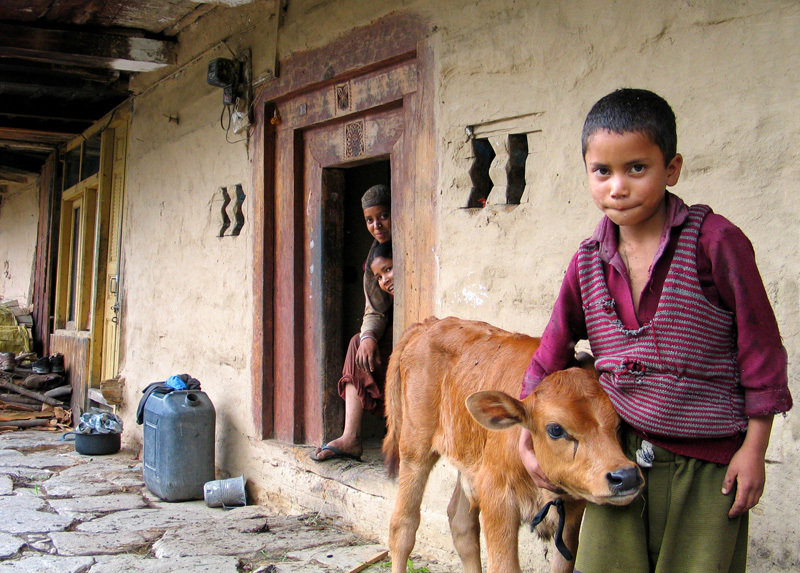 A family in Manali. 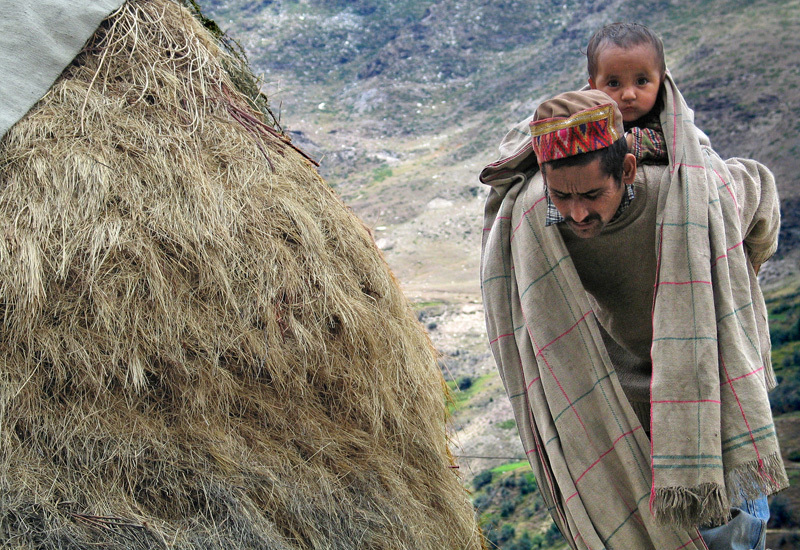 Even being agriculture the main source of income and employment in Himachal Pradesh, the state has one of the highest literacy rates in India. The Population Fund of India has rated Himachal Pradesh as a best in the country in the implementation of the Reproductive and Child Health programme. A boy walks on stilts in Keylong. 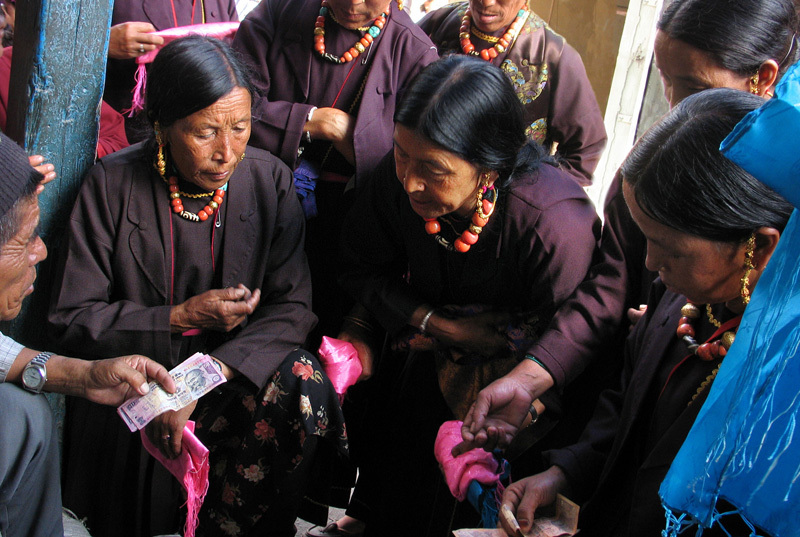 Ladies buying silk clothes in the market day at Keylong with their traditional neckless. 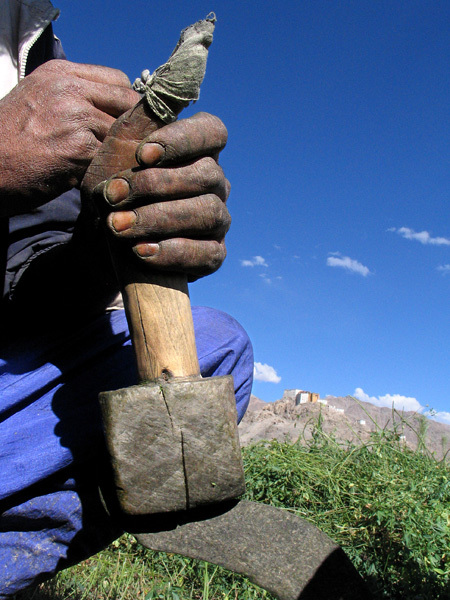 Himalayan tribal jewellery is usually made out of fossilized red Coral and lapis lazuly mined by hand. 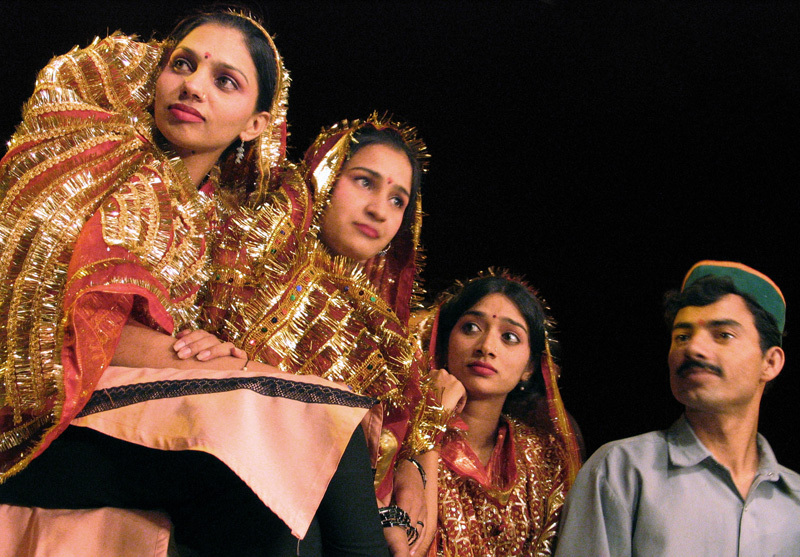 Dancers waiting their turn to perform at the celebrations of the Independence Day in Keylong. 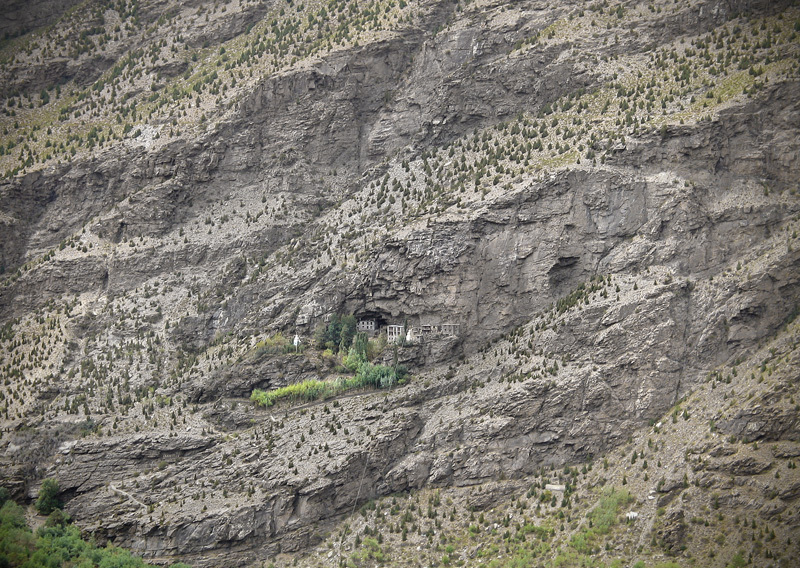 A Buddhist monastery hidden in a a cliff near Keylong. 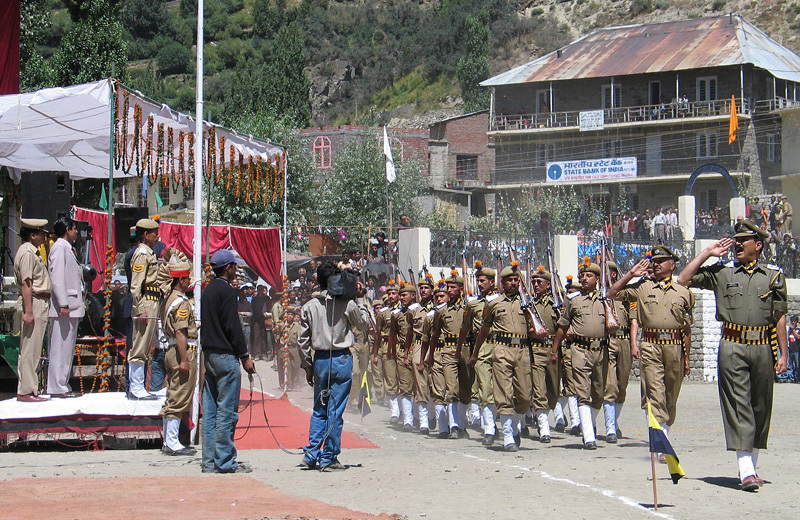 Military parade in Keylong in India's independence day. 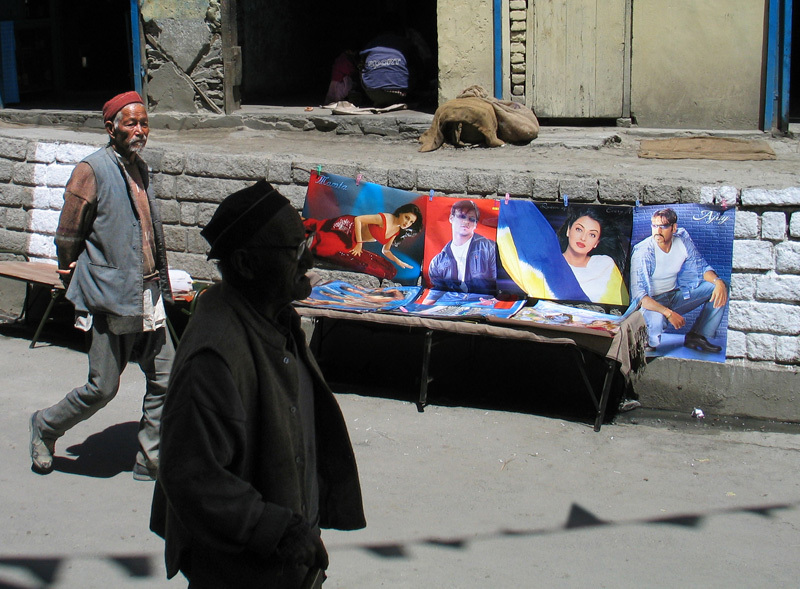 The posters sales of modern and fashioned actors in a small town market contrasts with the social reality of the place. 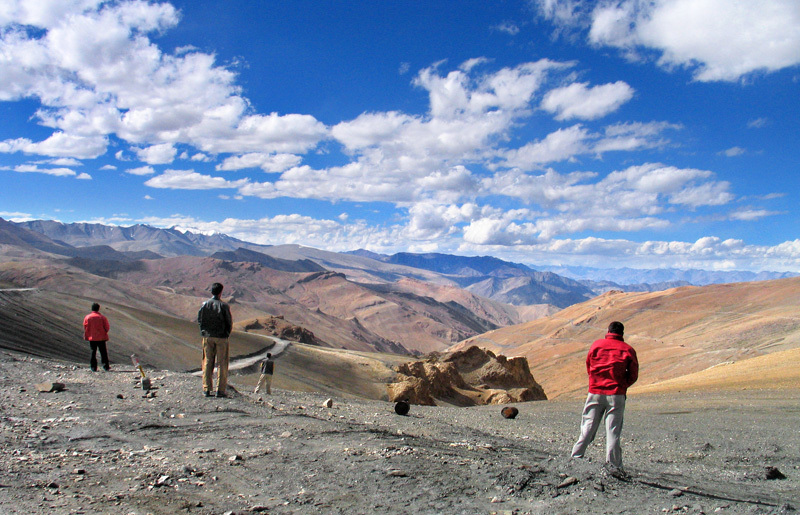 The Baralacha Pass (4,890 m) is a high mountain pass in the Zanskar range, connecting Lahaul district in Himachal Pradesh to Ladakh in Jammu and Kashmir. 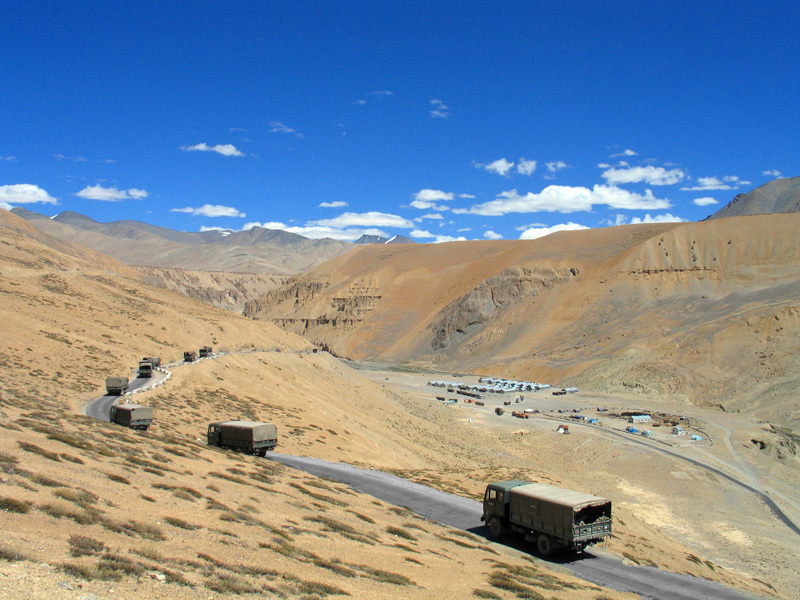 The Leh–Manali Highway, open only for four and a half months in a year in summer, was constructed because of the strategic importance of the area. It is capable of supporting the heaviest of army vehicles. 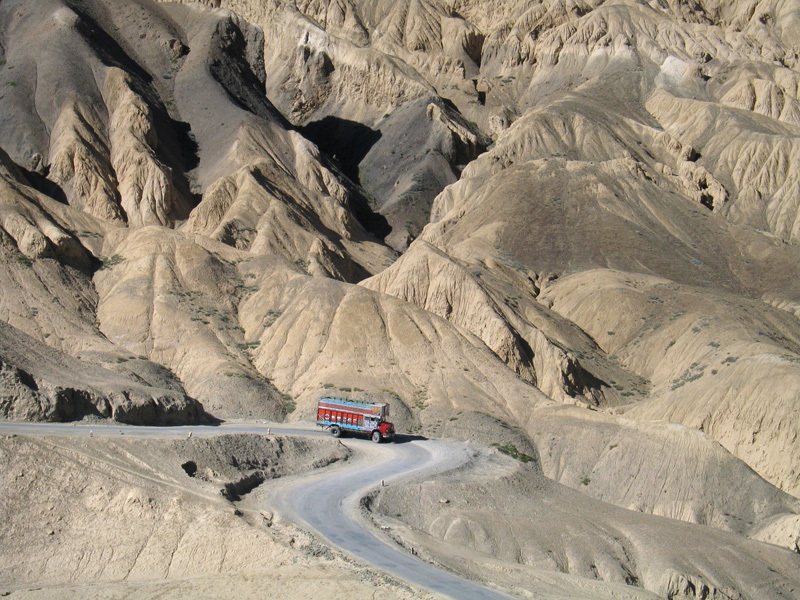 The bus ride from Manali to Leh, a distance of six hundred kilometers with its highest elevation at 5,328 m. through winding roads, demands patience and sometimes even courage. Technical stop. 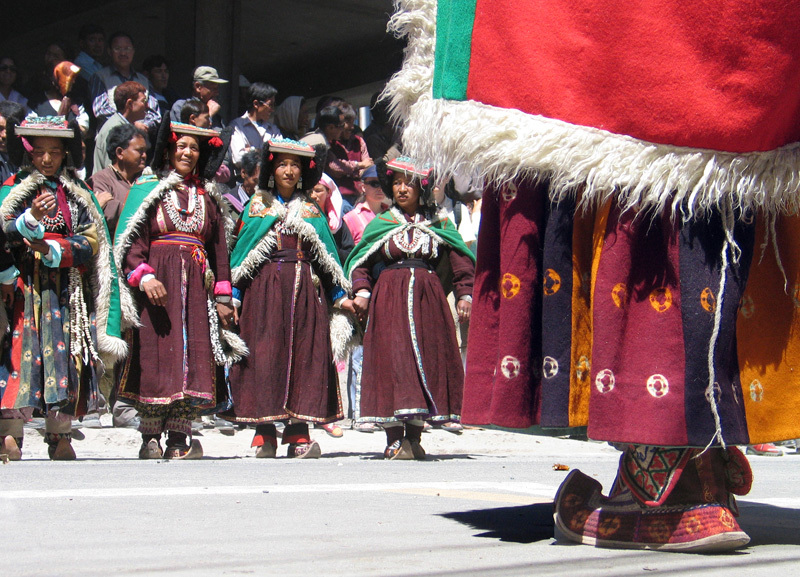 Women in traditional Tibetan clothes performing a folk dance. 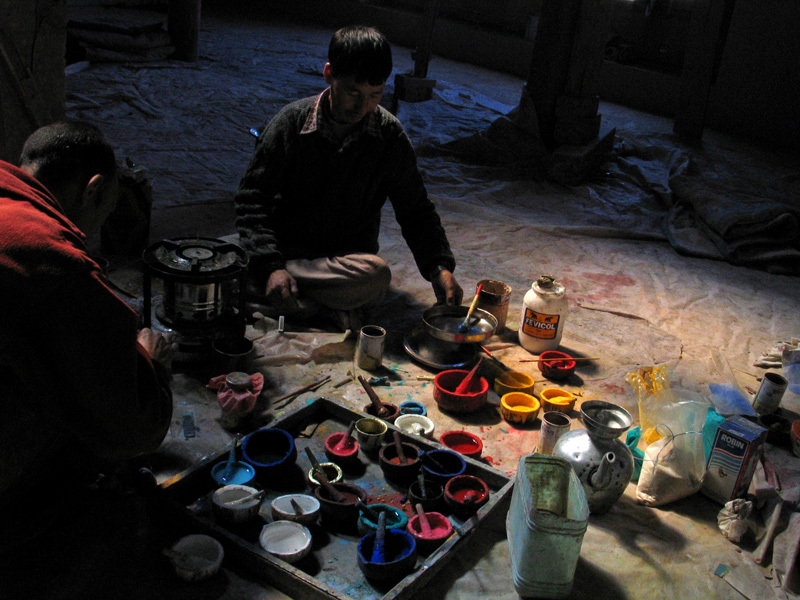 Annual Festival of Leh. 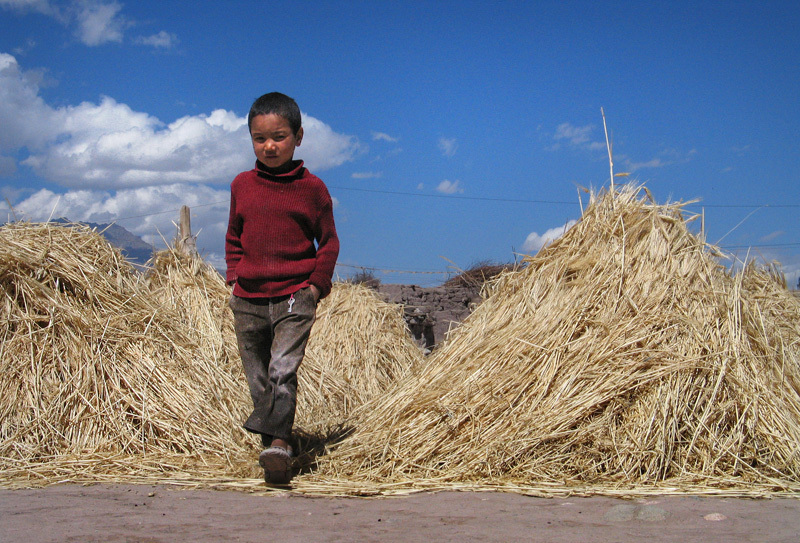 A worker rests while collecting grass. In the background, the monastery of Thikse. 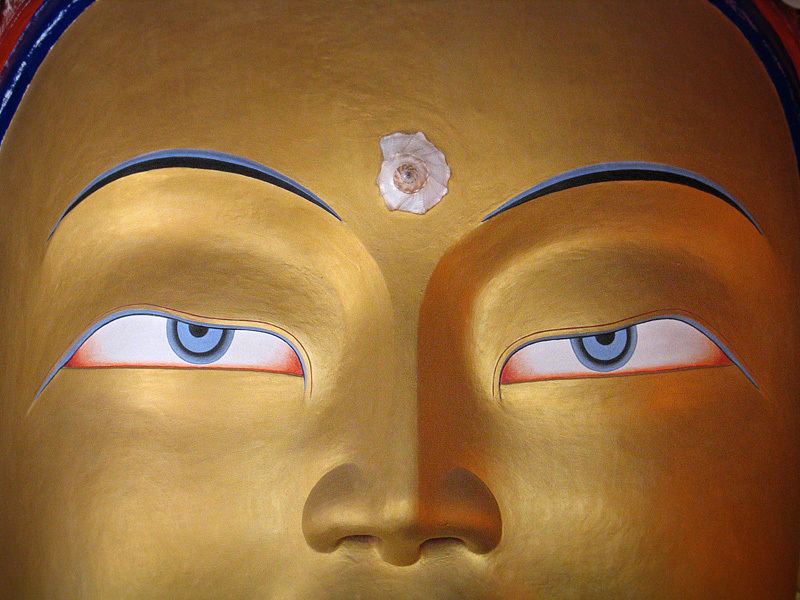 The Maitreya (future Buddha) statue of Thikse monastery, 15 metres high, covers two storeys of the building. Restoration work on paintings in the Stok Gompa. 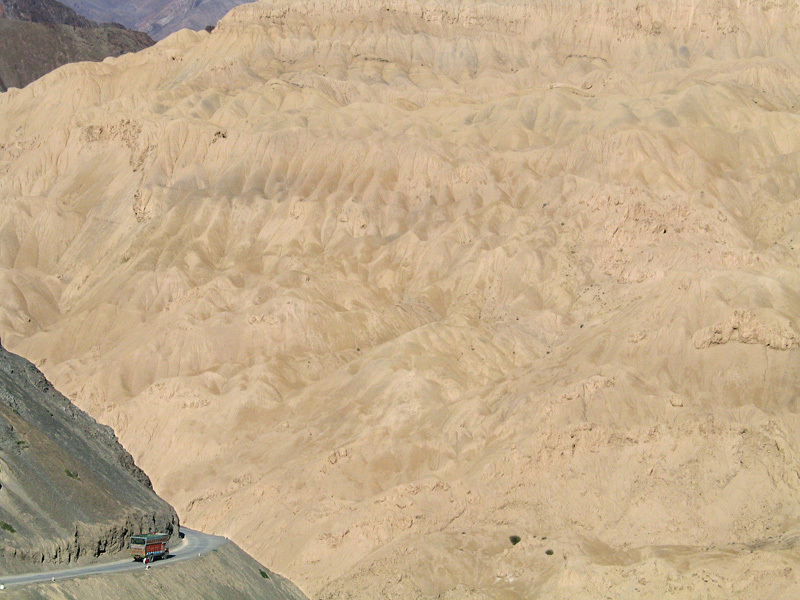 Roads in the Himalayas, hardly leave margin for error, accidents are fatal because of the huge drops. 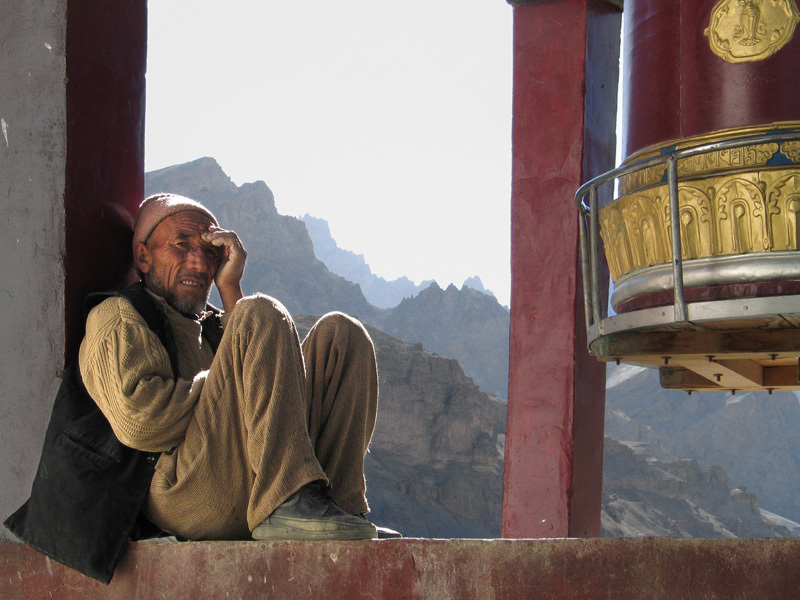 A man sitted in a Buddhist Prayer Wheel in Mulbekh. 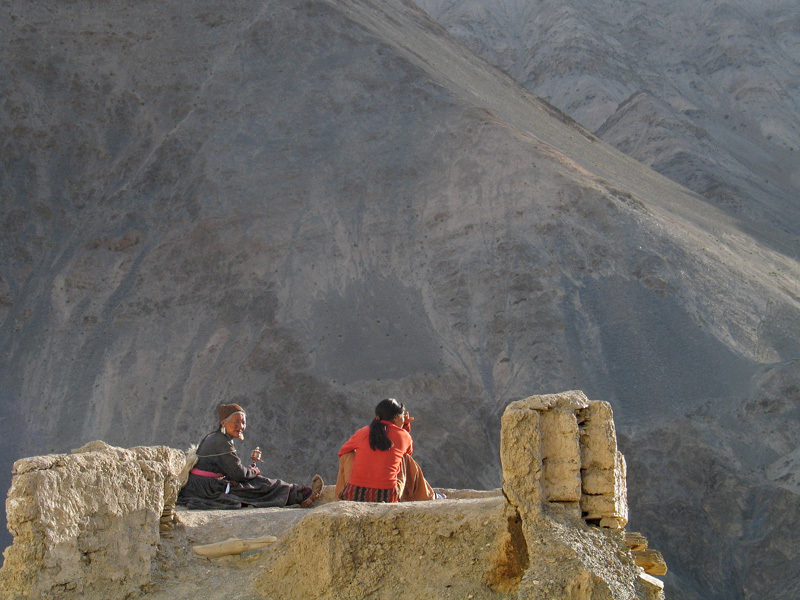 Mulbekh marks the boundary between the buddhist Ladakhi territories and the Kashmeere muslim culture. 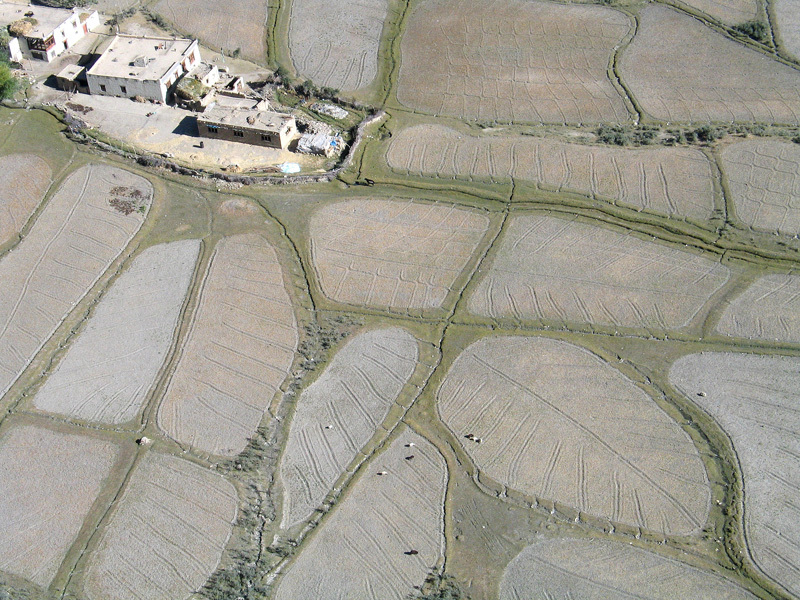 Aerial view of a family farm near Lamayuru monastery. 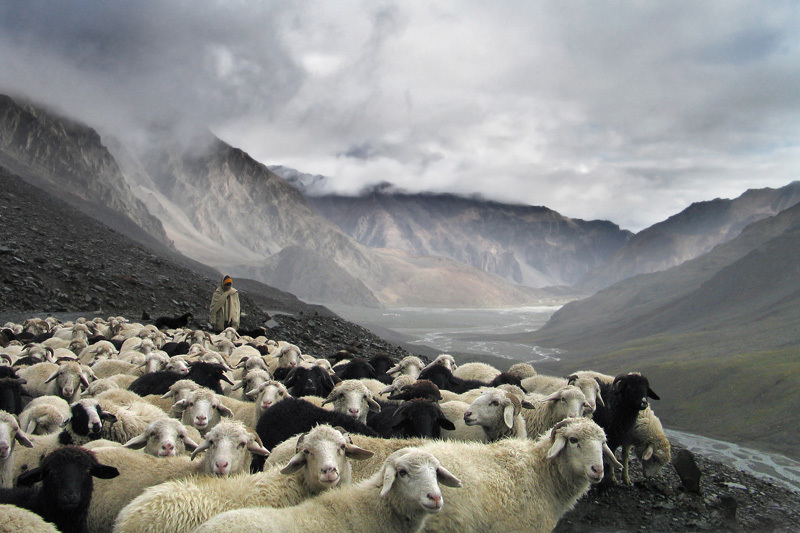 The economy in Ladakh has been based on small farms and herding. 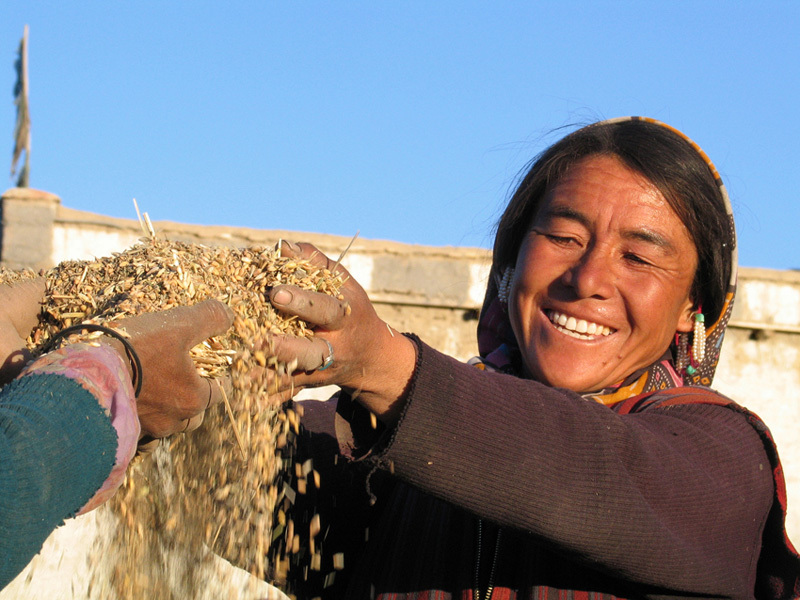 A lady separates barley grain from chaff in Mulbeck. 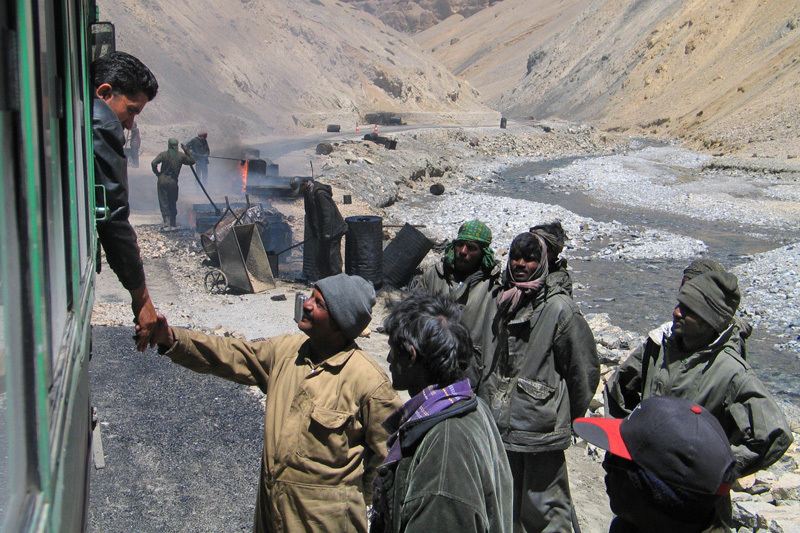 The working conditions of road maintenance teams are precarious. Tarred Workers. 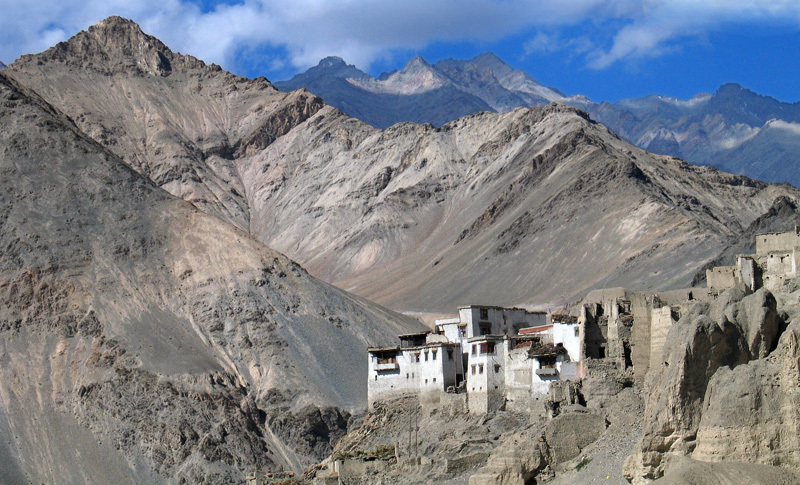 The oldest and largest existing gompa in Ladakh is Lamayuru. It was founded by Naropa on the 11th century, and is home of 150 monks. 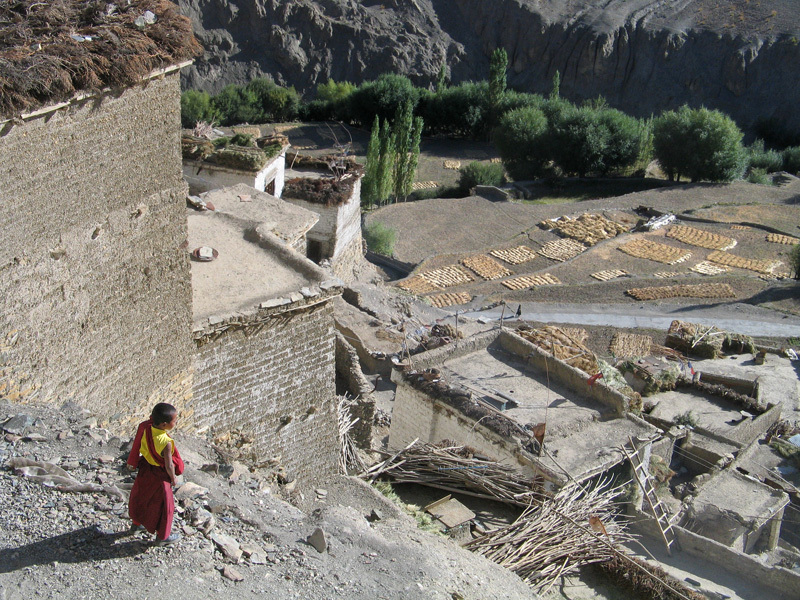 A novice monk looks at the view from a terrace in Lamayuru Monastery. An elderly Tibetan woman with a prayer wheel shares a moment with a younger woman. Lunar landscape in the Srinagar - Kargil - Leh road, 15 km east of the Fotu La, at a height of 3.510 m.
A dung beetle climbing a dune in the Thar Desert in Rajasthan. 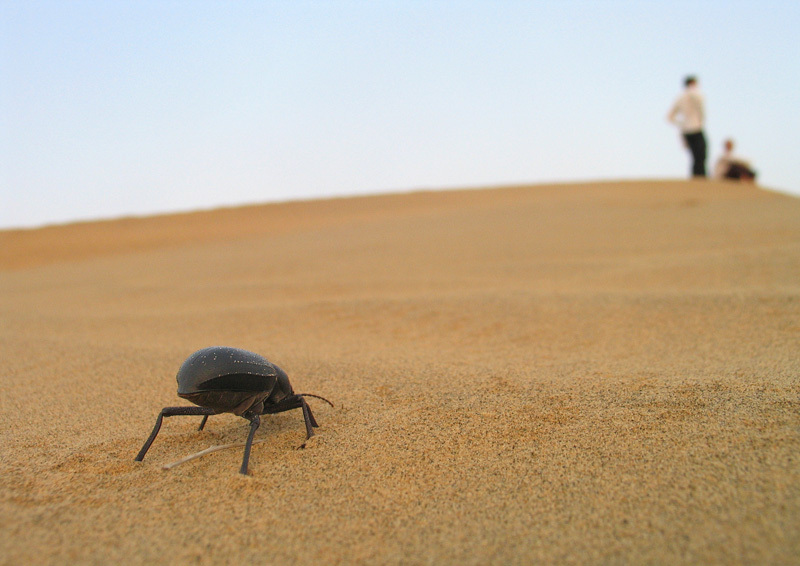 A cameleer preparing the dinner on aA dung beetle climbing a dune in the Thar Desert in Rajasthan..
With an area of more than 200,000 km2, the Thar desert its a natural boundary between India and Pakistan. 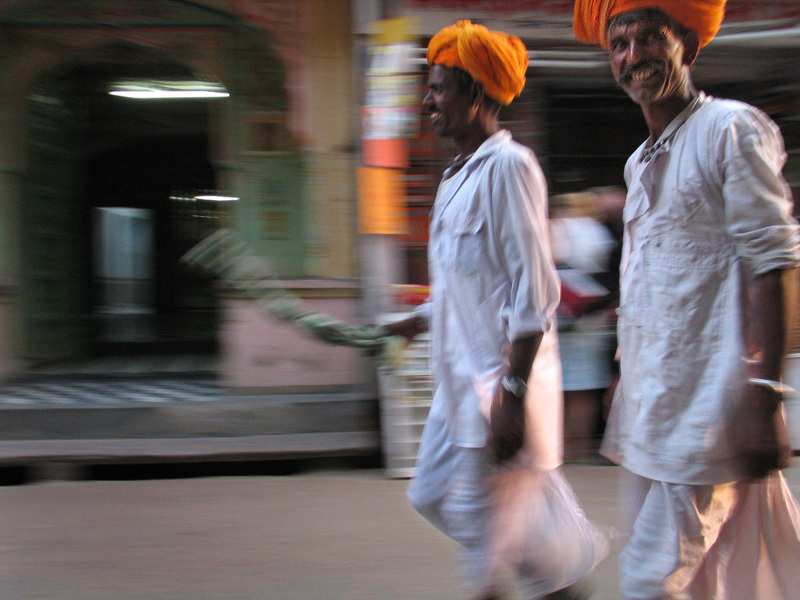 Turbans in Rajastan are referred to as the "Pagari". They vary in colour, size and style. They can also indicate the wearer's region, social caste or the occasion it being worn for. 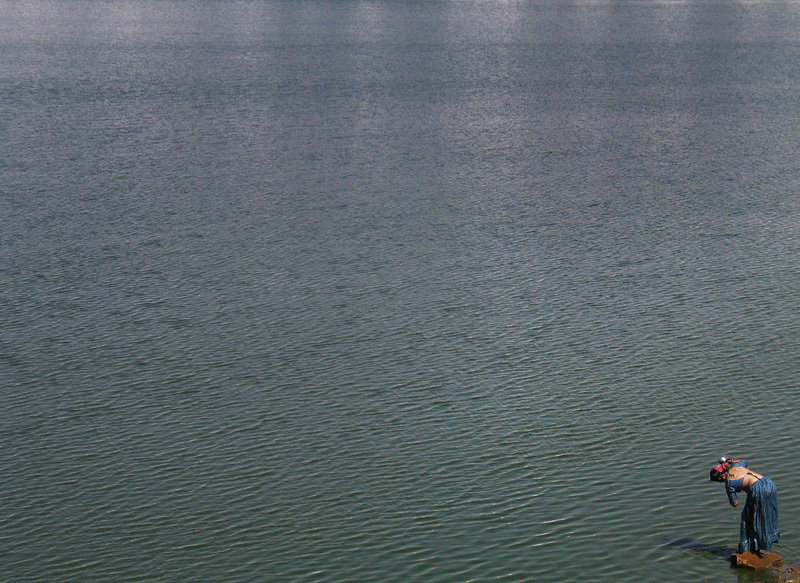 Taking a holy bath in the sacred Pushkar's Lake. 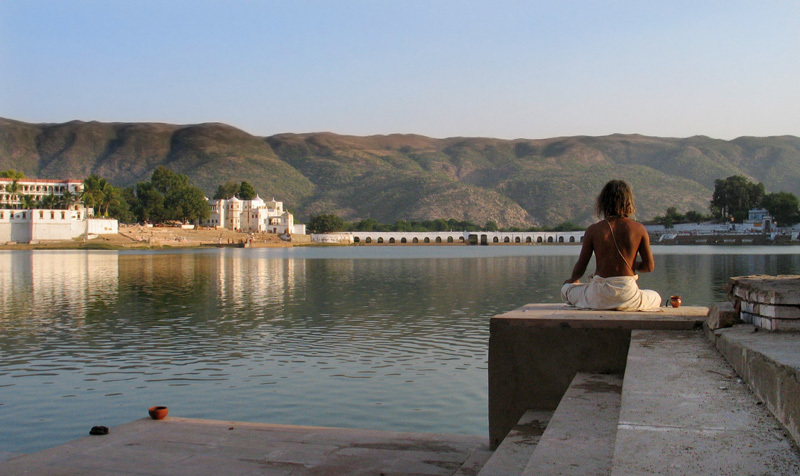 A Brahmin meditates facing the sacred lake of Pushkar.